9:00pm – 2:00am | FREE! We welcome you to a warm, deep blend of music to tantalize all your senses. Cafe Con Leche is a mixture of Afro Latin sounds, soulful rhythms rich with deep house. This innovative formula fused from different cultures incorporated with many aspects of jazz, soul, and funk promises to touch your very essence. 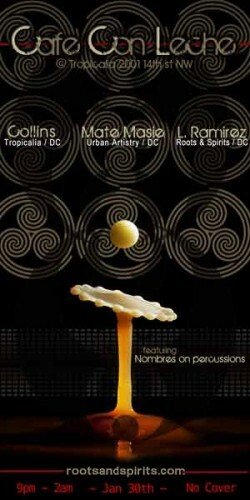 Cafe Con Leche will bring you a illmatic night featuring DC’s most original in the underground scene. COLLIN’s known for his deadly cuts and underground tracks as L. RAMIREZ is the dj with the bag of tricks, combining all elements of mixing, scratching, cutting, and freaking the music out. Most djs these days settle for the back to back blends whereas Ramirez is a risk taker keeping you on your toes. Joined by Urban Artistry’s RUSSELL “Iron Man” CAMPBELL aka Dj MATE MASIE known to be one of the most driven performers out here in DC.